One of the main reasons investors shy away from investing in crypto is the massive market volatility. The price of a coin can fluctuate up or down 20-30% in a matter of hours. This makes it challenging to use crypto for everyday transactions. While 100x gains aren’t uncommon in the new asset class, we’ve seen severe corrections over the years as well. A reddit thread calculates over 13 corrections in the last six years where the price fell more than 30%. The most severe correction in November 2013 saw an 87% drop with the price going from a high of $1,163 to a low of $152. The correction lasted until January 2015 and in the interim Bitcoin largely lay dormant. In fact, the price didn’t begin to rise again dramtically until March 2017. During the 411 days of “crypto winter” before the price rose again, critics decried Bitcoin was dead (again). The historical ups and downs of Bitcoin have become fodder for the mainstream media. Every time Bitcoin has a price correction, someone in the mainstream news declares Bitcoin “dead”. According to 99bitcoins.com, Bitcoin has been pronounced dead 315 times (and counting). The current crypto correction is clocking in at 70.61% down with the correction going on for 192 days. Part of the trouble with the crypto volatility is no one knows exactly how much one bitcoin is worth. Even one bitcoin doesn’t seem to be worth one bitcoin sometimes. While Bitcoin is often referred to as digital gold, there are many distinctions between the two. For almost 5,000 years, gold has been considered stable and sound money because the value doesn’t change dramatically. Historically, an ounce of gold could buy a fine tailored suit. That still holds true today. But what about bitcoin? 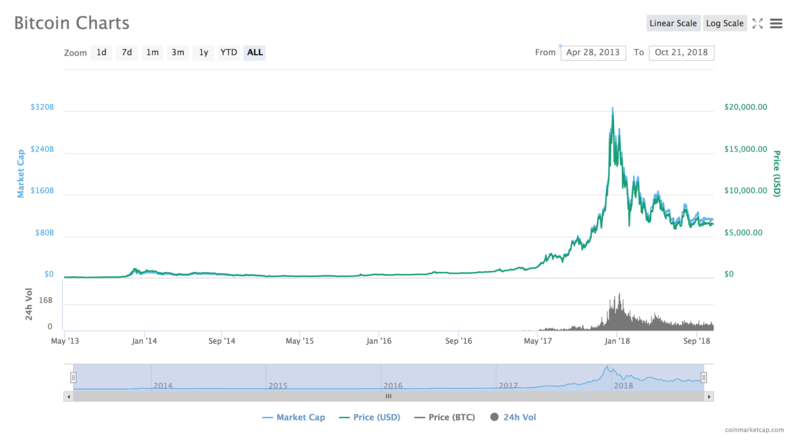 How much is one bitcoin actually worth if the price keeps changing and how can it be a true store of value? Crypto supporters often refer to Bitcoin as digital gold. The USD and other fiat currencies are subject to fluctuating exchange rates, inflation and ever-diminishing purchasing power. But arguably, crypto is far more volatile compared to most fiat currencies. In short, stablecoins are cryptoassets meant to act as a unit of account, and provide measurable stability and security. Stablecoins are still cryptoassets that exist on a blockchain, but they are meant to have no (or extremely low) volatility. The currency can still remain decentralized and does not have to be pegged to a nation-state or central bank. A stable currency would allow for practical every day usage of crypto. Stablecoins are often created by Decentralized Autonomous Organizations (DAO), sometimes called a Decentralized Autonomous Corporation (DAC). Supporters believe a few characteristics must be present for the coin to be truly stable. Ideally, it should be legally protected, audited regularly and transparently, and 100 percent collateralized. The concept of stablecoins is already in practice, most notably with the cryptoasset Tether (USDT). Tether is a crypto asset pegged to the USD and many exchanges have adopted the use of USDT. Due to the regulatory complications of running a crypto exchange, sometimes you can’t wire fiat money to a crypto exchange, but can hold a stablecoin such as USDT. This way, if you’d like to keep funds on an exchange in reserve in between trading, the exchange may not hold USD for you, but they may hold Tether. However, Tether has been fraught with claims of fraud and initially refused to have their financials audited. Tether claims the assets are fully backed and had a law firm perform an report (but not an independent audit) in June 2018. Tether is established in the crypto community and well integrated, which is a great advantage. Traders treat Tether as a 1:1 with the USD. But, Tether is centralized which crypto-purists claim make it not a true cryptoasset. NuBits was another stablecoin that aimed to provide a 1:1 peg with the USD. However, NuBits decoupled with the US Dollar in March of 2018 and has not been able to maintain it’s stable peg. Bitcoin and cryptoassest will provide utility for the larger financial system, but first they need to be stable. Imagine if your interest rate on your mortgage changed everyday? Or if when you went to buy a coffee the price changed dramatically because the value of the dollar changed dramatically too. It’s not practical for mass adoption. Any use that requires price stability and low volatility, such as consumer loans or cross-border payments cannot be denominated in an asset that could fluctuate as wildly as Bitcoin or Ethereum. With Bitcoin and other cryptoassets pegged to stablecoins, the much needed stability can be provided so crypto can be used by the public at large. If stablecoins can truly take the place of a unit of account, like the dollar or yen, those stablecoins could then be traded as well for profit or arbitrage. One crypto exchange based in Singapore, Huobi, recently announced they will allow users to swap between four different stablecoins: TrustTokens’ TUSD, Paxos’ PAX, Circle’s USDC, and Gemini exchange’s GUSD. Crypto collateralized: backed by reserves of another cryptocurrency. Dai, the token from MakerDao is backed by Ethereum. Non-collateralized: backed by nothing, but their supply is algorithmically limited by smart contracts. The smart contract computer code can then increase or decrease the supply to keep the price stable. Basecoin is an example of this type of non-collateralized stablecoin. There are a couple notable stablecoins emerging in the cryptomarket that show great promise and are backed by incredibly smart, talented development teams. Dai is a new stablecoin project from MakerDAO. The Dai is pegged to the USD and aims to be a 1:1 stablecoin. Dai hopes to be the first “working consumer-grade stablecoin.” The Maker system is a mix of crypto collateralized and non-collateralized technology. The Dai is backed by Ethereum and smart contract technology. Like the Bitcoin blockchain, the Maker system is trustless and does not rely on third-party intermediaries. This avoids any funny business when it comes to accounting. Because Dai is backed by Ethereum, if the ETH price remains stable (unlikely), the Dai price will remain stable as well. However, if the ETH price fluctuates (guaranteed), the smart contract technology kicks in to incentivize miners to make more Dai, or auction off enough Dai so the price remains stable. The technology is new and highly complex, but developers in the crypto community are extremely excited about Dai’s potential as a stablecoin. GUSD is a stablecoin released by the Gemini crypto exchange. The Winklevoss twins own Gemini exchange. GUSD is a fiat collateralized stablecoin backed by US dollars. State Street Bank and Trust Company will hold the USD correlated to the GUSD in circulation. The stablecoin will have ongoing examination, with their U.S. dollar deposit balance “monthly by BPM, LLP, a registered public accounting firm, in order to verify the 1:1 peg.” Gemini users can convert U.S. dollars inside their Gemini account to GUSD. Additionally, users can withdraw GUSD to an Ethereum address. While the technology for GUSD isn’t anything new or notable, the fact that a large crypto exchange is creating their own stablecoin begs attention. Further, the Winklevoss twins have been publicly supportive of the crypto community working with regulators and are currently attempting to launch their own ETF. Paxos’ PAX, TrustToken’s TUSD, and Circle’s USDC are other stablecoins aiming to gain traction in the space. Ultimately, many crypto supporters believe a stablecoin or stablecoins is the way to greater adoption and increased price stability. Once cryptoassets are price stable, they can be utilized for more than just speculation, including a true (stable) store of value, credit line, loans, etc.